Slice each celery stalk in half, then slice celery very thinly on a bias at a slight angle; you should have about 3 cups. Cut carrots into halves or thirds depending on their length, square off the sides, and then cut them into matchstick-size pieces. Remove the core from the head of cabbage. Cut the cabbage in half again lengthwise. Slice cabbage pieces very thinly crosswise. 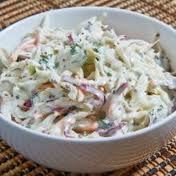 Combine celery, carrots, cabbage, and shallots in a very large glass mixing bowl or pot, and set aside. In another bowl, combine vinegar, mayonnaise, and blue cheese, and mix well. Add dressing to vegetables, and mix until evenly coated. Cover and let marinate, refrigerated, for at least 1 hour or up to 24 hours.